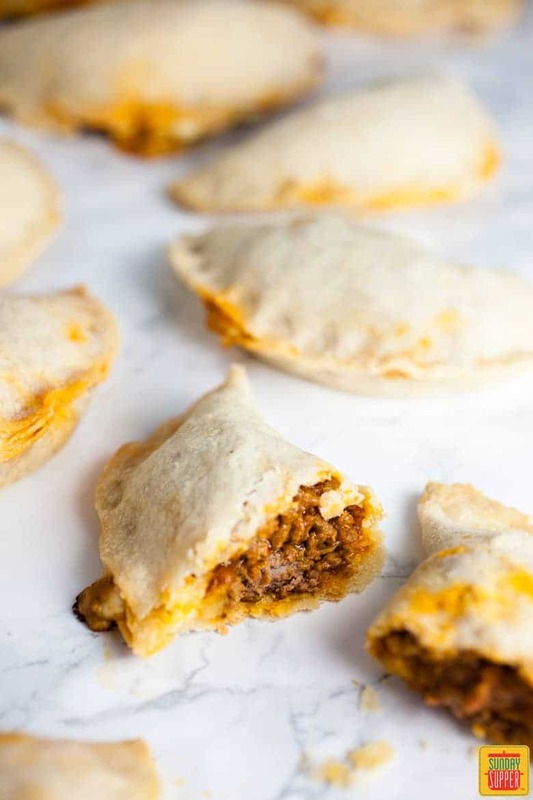 Baked Puerto Rican Meat Pies, also known as baked empanadas, are stuffed with a flavorful ground beef mixture and baked to perfection. 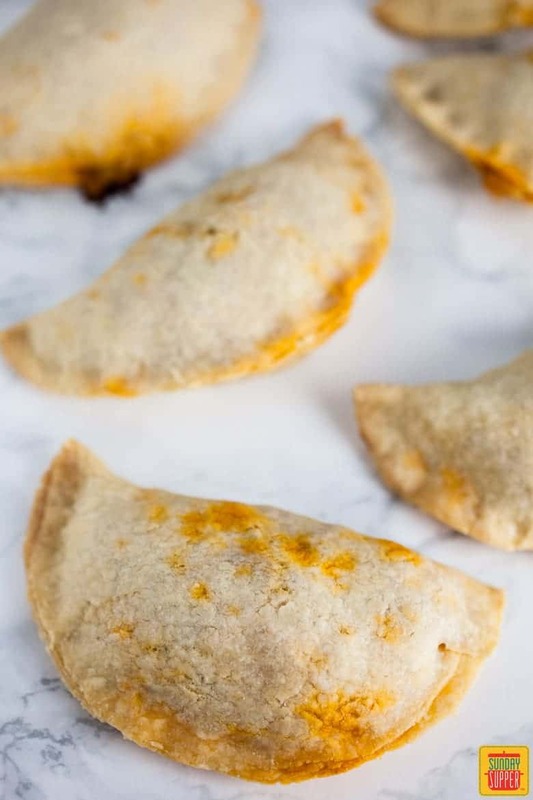 Your family will LOVE these Puerto Rican baked empanadas. They make a great appetizer for a party or are perfect for Weekday Supper! Nothing makes me more excited than trying foods and recipes from other cultures. Food truly knows no boundaries and I love the chance to experience what people from other countries eat on a daily basis. It seems that there are certain dishes that are common to different cultures across the globe. A dish that every country seems to have its own version of. One of those dishes is the empanada. What is an Empanada or Meat Pie? An empanada is basically a savory meat pie. A mixture of ground meat is cooked down with spices, stuffed into a bread-like disc and then baked or fried. The type of meat and the spices used may vary across cultures but the basic concept is the same. The one thing that all of these stuffed meat pies have in common is that they are all delicious. I’ve never met one I didn’t like. I was very happy to have discovered these Baked Empanadas. Another type of meat pie you might like to try is our Individual Guinness Beef Pot Pies . These meat pies feature a rich stout beef stew topped with a flaky puff pastry crust and perfectly portioned in individual ramekins. The thing that sort of ‘holds’ empanadas together is a pie-like dough. Baked Empanada dough works the same as pie crust. 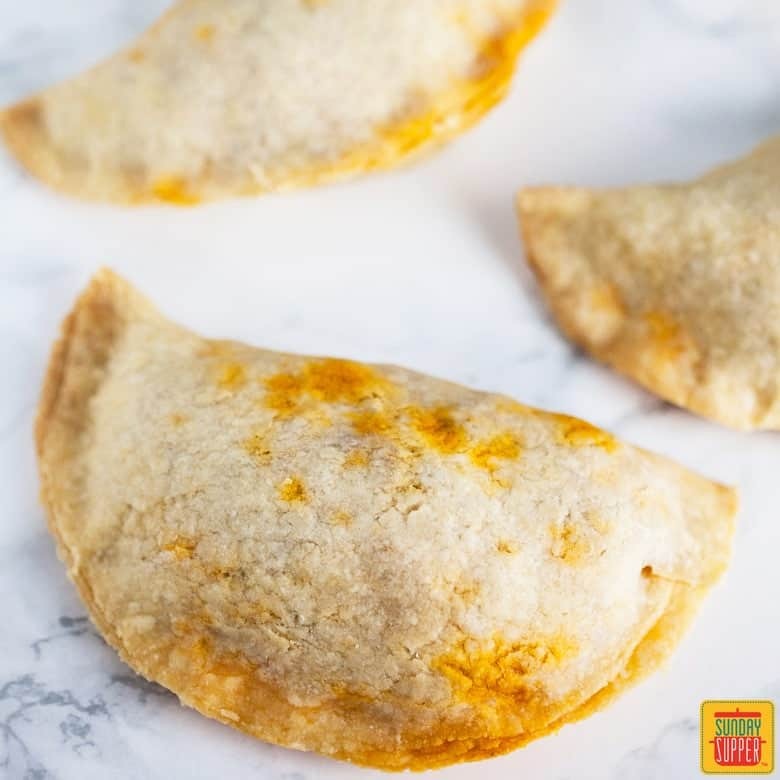 To make life easy you can purchase a pre-made empanada dough such as Goya Discos or you can use a pre-made pie dough from the refrigerated section of your local grocery store. I went with a homemade dough for this baked empanada recipe and found it to be enjoyable to make and totally delicious. This recipe is easy as far as homemade dough goes. Add 2 ½ cups AP flour, 1 stick of butter that has been chilled and cut into small pieces, 1 egg, ¼ cup cold water, and a pinch of salt to a food processor. Pour the mixture out onto a piece of plastic wrap and form it into a ball with your hands. The egg helps to hold the mixture together. Wrap the plastic around the ball of dough and refrigerate for 30 minutes. 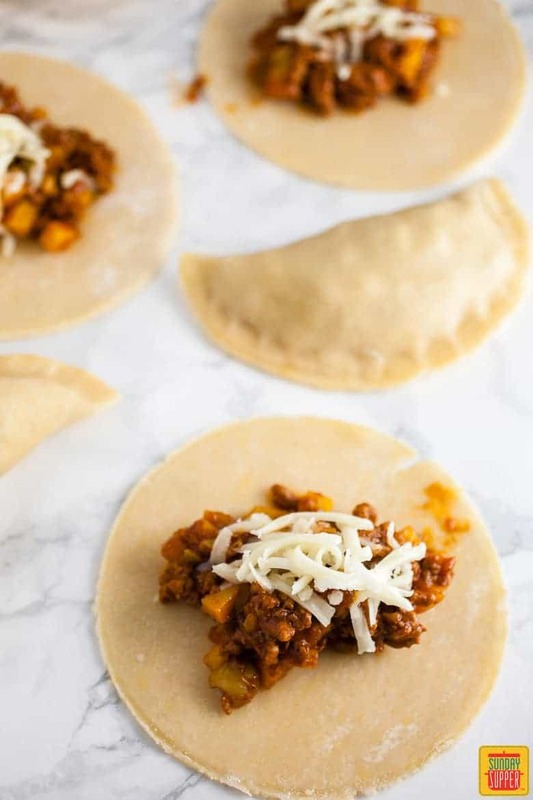 After the empanada dough has chilled, remove it from the refrigerator and remove it from the plastic wrap for rolling and cutting. Sprinkle some flour on a clean surface and begin to roll the dough out with a rolling pin. Try to get the dough as thin as possible. Next, take a small plate or bowl that is 5-6 inches around and place it on the dough. Use a knife to cut around the bowl. Carefully pick up the discs of dough and set them aside. Ball up the extra dough and roll it out again for another round of discs. Repeat this until all of the dough is used up. You should end up with 10-12 discs. Cook the beef completely and break it up as it cooks. Drain any excess grease when it has fully cooked. 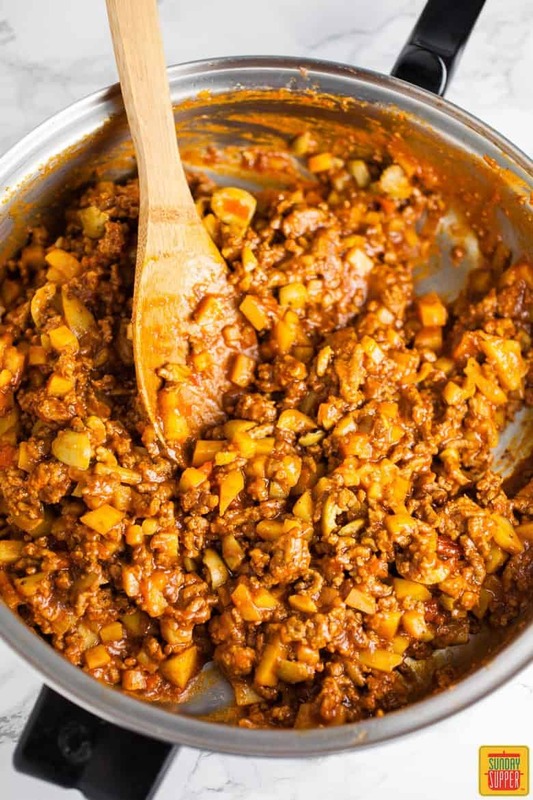 Add all of the diced potatoes, ¼ cup Goya sofrito (sofrito is a Puerto Rican cooking base consisting of tomatoes, onions, garlic, peppers, and spices), 2 Tbsp. Goya Recaito (recaito is a cilantro cooking sauce), and a ¼ cup of water. Cook for 10 minutes, stirring often. At this point, stir in 1 8 oz. can of tomato sauce, 1 Goya Sazon con Azafran seasoning packet, and another ¼ cup water. Stir and cook for another 5 minutes. The final step is to add 20 chopped Spanish olives to the pan and stir. The next step is to fill the empanada rounds with the cooked beef mixture. Place the pastry rounds on a clean surface and spoon 2 heaping Tbsp. or so of the beef into a pastry round. Top it with a sprinkling of Monterey Jack cheese. Do not over-stuff the rounds or they will break apart as they cook. Brush the edges of the pastry with a little bit of water. This will help hold the dough together. Fold one side over the other and press the edges together with your fingers. Make sure the edges are sealed tightly and crimp them together with your fingers or a fork. Repeat with the remaining pastry rounds. Spray a baking sheet(s) with cooking spray and place the meat pies on it. You may need two baking sheets or alternately you can bake them in two batches. Pop the pan(s) into an oven that has been heated to 350 degrees. Bake the empanadas for 25-30 minutes or until the crust is nice and golden. Once the baked empanadas meat pies are finished, remove the pan(s) from the oven and serve immediately. I’m telling you – These baked empanadas are worth all the effort. The meat is savory, the dough is a little sweet, and the olives provide this salty kick. The potatoes are hearty and filling too. Your whole family will LOVE these meat pies! 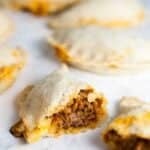 Baked Empanadas meat pies make a great party appetizer as well. I’m looking forward to trying more dishes from Puerto Rico! Your family will love these Puerto Rican empanadas. They make a great appetizer for a party or are perfect for a weeknight supper! Pour the dough mixture out onto a piece of plastic wrap. Form the mixture into a ball with your hands. Wrap the ball of dough tightly in the plastic wrap and place in the refrigerator for 30 minutes. After 30 minutes, remove the dough from the fridge. Sprinkle some flour on a clean surface. Roll the dough out with a floured rolling pin. Roll the dough as thin as possible. Place a 5-6 inch round bowl or plate onto the dough. Run a knife along the edges of the bowl until you have cut a round disc. Remove the dough round and set aside. Repeat with the rest of the dough. The dough will need to be formed into a ball and rolled out a few more times to cut the rest of the dough rounds. Repeat until all the dough has been cut into rounds. 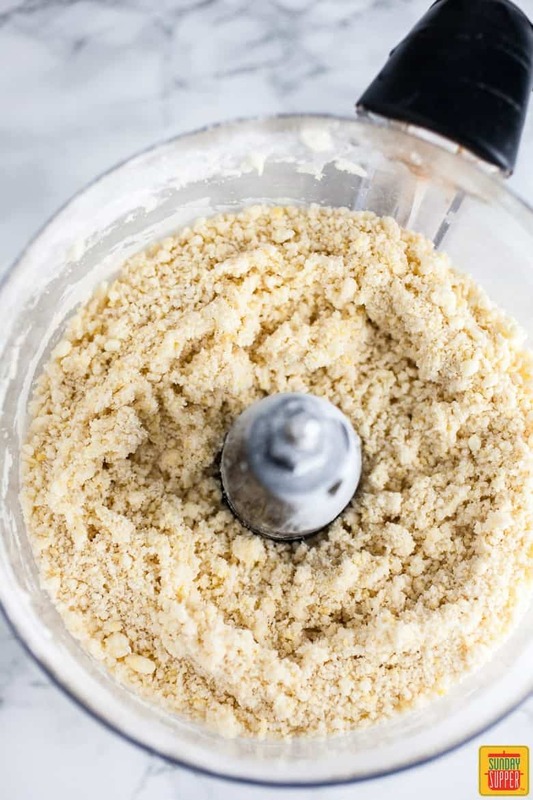 Add 2 ½ cups AP flour, 1 stick of cold butter that has been cut into small pieces, 1 egg, ¼ cup cold water, and a pinch of salt to a food processor. Pulse until the mixture resembles coarse crumbs. Peel a medium potato and dice into small pieces. Heat a large skillet to medium and add 1 lb. of ground beef. Cook the beef completely and chop it into pieces as it cooks. Drain any excess grease when it has finished cooking. Add the diced potato, ¼ cup Goya sofrito, 2 Tbsp. Goya recaito, and ¼ cup water to the pan. Cook for 10 minutes, stirring often to prevent the potatoes from sticking. Add an 8 oz. can of tomato sauce, 1 Goya Sazon con Azafron seasoning packet, ¼ cup water, and a pinch of salt. Cook for an additional 5 minutes, stirring often. Toss the olives into the pan and stir. 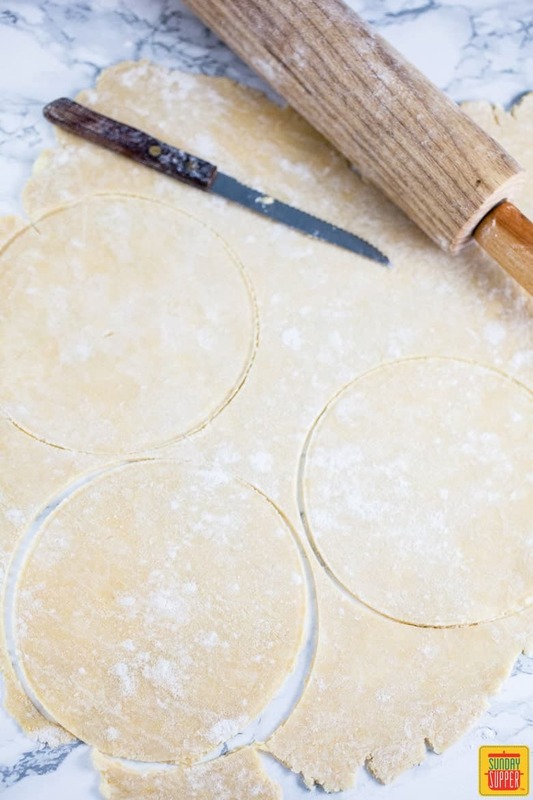 Place the pastry rounds onto a clean surface. Spoon 2 Tbsp. or so of the meat filling into a pastry round. Top it with a sprinkling of Monterey Jack cheese. Rub the edges of the pastry round with a little bit of water. Pull one side of the pastry over the other and press the edges together with your fingers. Seal the edges tightly and crimp them together with your fingers or a fork. Try not to over-stuff the pastry rounds or they will break as they cook. Repeat with the remaining pastry rounds. Spray a baking sheet(s) with cooking spray. Place half of the empanadas on each pan. Place the pan(s) in the oven and bake for 25-30 minutes or until the dough is golden brown. You can use two separate pans or bake them in two separate batches. Remove the pan(s) from the oven when the empanadas are finished baking and serve immediately. Bake for 20 to 25 minutes, until golden brown. Serve immediately, or cool completely and freeze in airtight containers or bags. Note: Baked Puerto Rican Meat Pies was originally published on Sunday Supper on February 28, 2016 by Janet Keeler. The recipe has been updated to include a homemade empanada dough recipe as well as new photos. Your pies look beautiful! It’s it fun to do the things that remind us of childhood? Delicious!! Baking is definitely the way to go, thank you for sharing your memories. My dad went to high school in Puerto Rico, I’ll have to see if he’s had these and make them next time he visits. The smells and taste of the foods of Puerto Rico. My father was USCG, we lived there from 1950 to 1957 and again from 1963 to 1967 in a little “hole” called San Pat (ya had to be there). Mom (Tennessee girl) would make rice and chicken and rice and pork. I finally got up the courage a few years ago to try and make it, not bad, but needed work, second batch was much better. I REALLY missed /miss the pan de agua and Pastelillos de Carne (meat pies) we used to buy off the little street vendor carts, now I am gonna try it. They used to tell us NOT to eat foods from those carts, didn’t kill me and it was some of the best cooking. Wish me luck. hahaha Thanks for the post and ideas, all I have to do is find the Goya Discos here in NC. Mabe sub cresent rolls? Puerto Ricans do not make empanadas. We make pastelillos.